Everyone who has done any serious car repairs has one. The makers and providers of tetanus booster shots count on it. You dread looking inside, because the sifting can be alternatively tedious and fruitless, but you must occasionally wade in with both hands to find that one rusty fastener that will complete the project without a run to the hardware store. The bucket of bolts. In this case, my bucket of bolts. The bucket defies all attempts at organization. It’s a catch-all for the stuff left over. In this case, the bucket is a testament to a string of automotive projects that were never quite finished. Last night, I burrowed with both hands in search of some Miata bolts for a friend. I’ve mentioned my Miata before – but few know that I once had a trio of the happy little roadsters. The blue one is my baby – the one that started this particular obsession. The white one was a clean Southern rolling chassis that was destined to become a race car. The red car – a rusty, but running parts car, meant to donate its heart to the eventual racer. Of course, life gets in the way. So do nosy neighbors and threats from code enforcement. Since the red car was “ugly”, and missing some parts, it was deemed an eyesore, and I had a limited time to dispose of it. In a cold, snowy Ohio winter. Parts were stripped hastily before the deadline given by the city, with yours truly often laying in a slushy driveway. Once stripped, the front clip went to resurrect another race car, and my garage was packed with various bits of Miata. 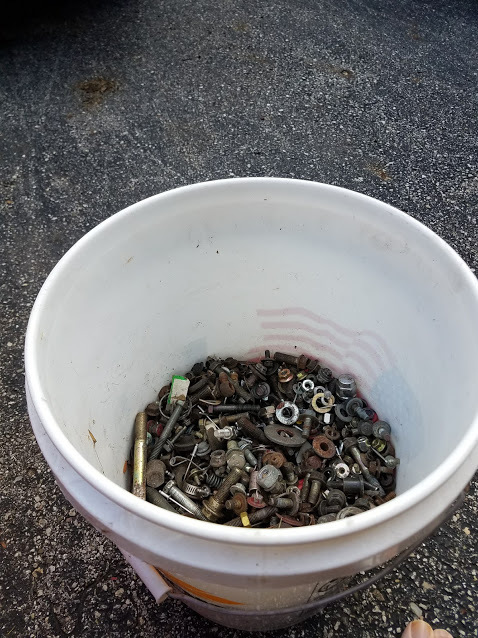 The bucket has a bunch of red-painted nuts and other fasteners from the rusty heap. Yet again, life interrupts plans. Kid gets sick, medical bills mount, and I needed cash. I’m told the white car and some parts are now a race car somewhere in Indiana. I’m reminded of my automotive literary hero, Peter Egan of Road & Track, who penned an essay on the storied “Buckets of Bolts” way back in 1990 – it’s in the first collection of his “Side Glances” column. There, Egan reflected upon the various bits and pieces that filled his particular bucket, from bike and go-kart parts, to the detritus accumulated as a British car mechanic. As I dug deeper in my bucket, I was reminded of a silly business venture I attempted a few years prior – again, focused on amateur motorsports. It seems that Columbus was rich in a resource vitally important to racers – a trove of well-stocked junkyards. Sporty imported cars like Honda Civics and Nissan Sentras tend to rust away around here, leaving the salvage yards dotted with mechanically sound hulks. After tracking down parts for my own projects, and those for friends, I realized this particular treasure could be lucrative. I started stripping common bits and re-selling them via racing forums. It wasn’t as profitable as I’d hoped. Thus the bucket continued to fill. The blue Miata remains, waiting for the day when life and the stars align. The elusive bolts? Nowhere to be found. But the reminder of abandoned projects past was invigorating. No tetanus booster required.